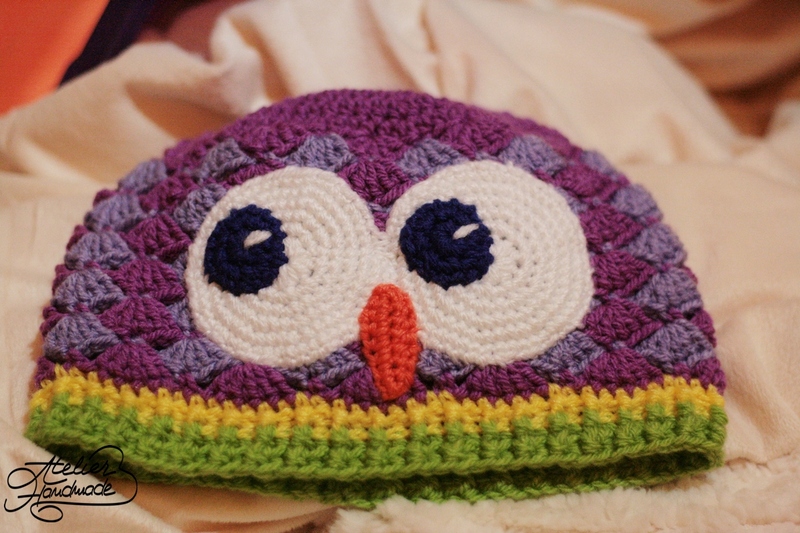 This is a tutorial for an Owl Shells Beanie I made a few weeks ago for a 1,5 year old sweet baby girl. The final beanie was about 48 cm and the depth was of 17 or 18 cm. If you want to make a bigger version, just increase more rows. The beanie was lined with fleece, suitable for winter as well. 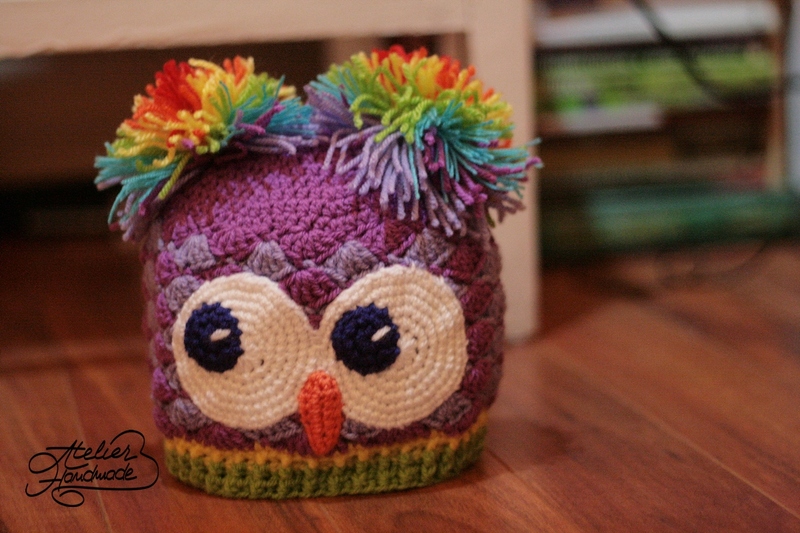 I know that on this great world wide web there are many, many amazing tutorials of owl beanies, but I wanted to make one without the long ears. I always improvise when I am making a crochet item. 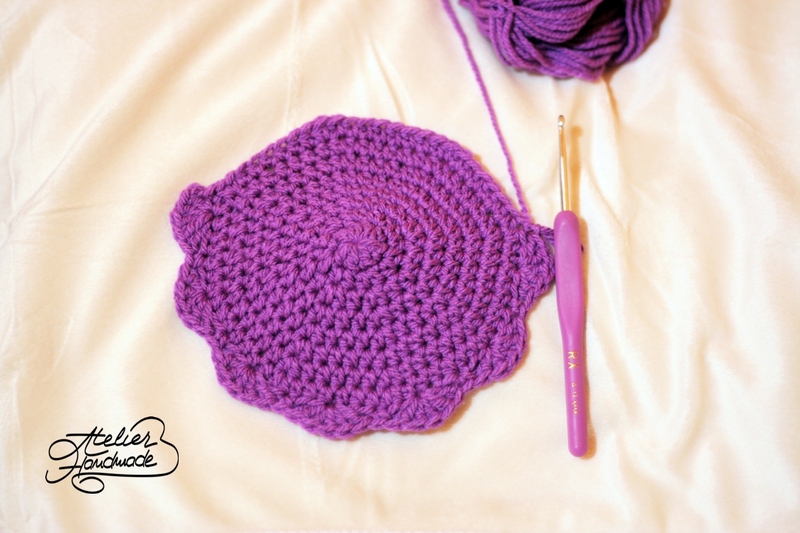 For this beanie I have used the 4 mm crochet hook and Red Heart Detroit yarn, in colors: violet, purple, yellow and green. 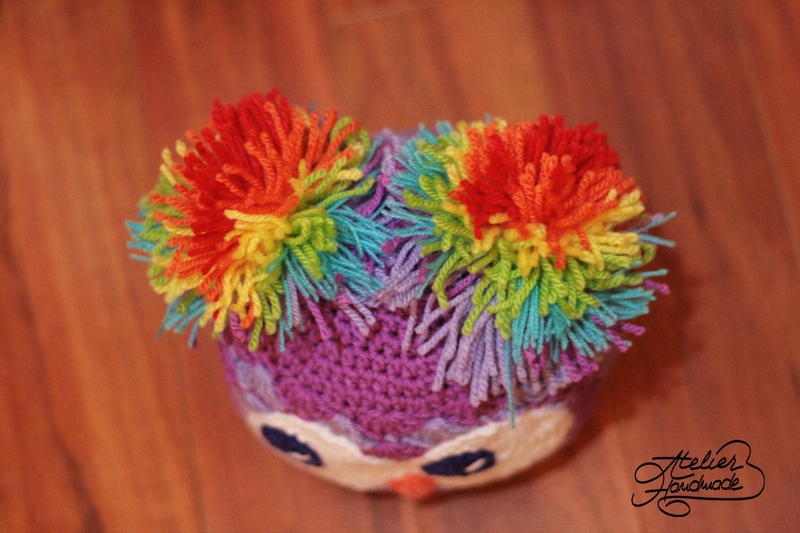 For the rainbow pom-poms I used scraps of yarn I had around the house. For this beanie I worked HDCs in the rounds, joining only at row 8. 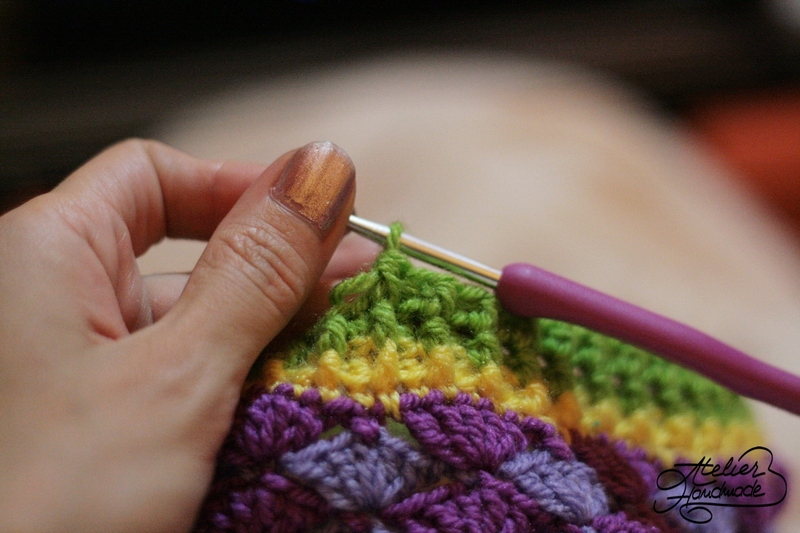 Just use a scrap of yarn or a marker to mark where your row begins and ends. R8: *1 HDC in the next 6 sc, 2 HDC in the next sc*, repeat till the end of the row = 62 HDC. Join rows at the end. R9: make 11 shells: ch 2, 4DC in the same sc, *skip 2 sc, 1 sc, skip 2 sc, 5 DC in the same sc* repeat till the end = 11 shells. A shell is made of 5 DC in the same sc. R10: change color and make 11 shells on each row. Repeat R9 and R10 until you have reached 14 cm in depth. The rest of the 4 cm will be the FPHDC and BPHDC rows. Always measure your work in progress! With yellow make a row of sc. The second row of the edging will be the first FPHDC and BPHDC row. Alternate one FPHDC and then a BPHDC. Make 2 rows with yellow yarn and then change to green yarn and work 5 more rows of FPHDC and BPHDC. 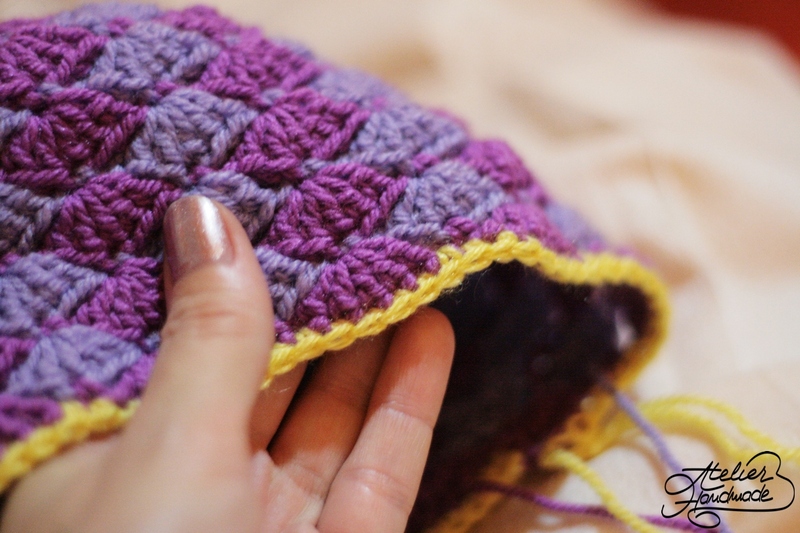 If you do not know how to make the front and back post half double crochet, check out RepeatAfterMe’s video. For the eyes of the owl use white yarn and follow rows 1 to R4. For the blue/black pupils follow R1 and R2. For the beak I used orange yarn and worked as it follows: ch 11, HDC in the second ch from hook, work 5 DC in the next 5 sc, 1 HDC in the next 2 sc and 2 sc in the last 2 ch. Repeat the same stitches on the other side of the beak. To add a „Too fluffy to handle it” look, I made 2 rainbow pom poms to go with the beanie. I find it cute and girlish. p.s: I am sorry for the low quality of the pictures, I made this beanie one night when I could not sleep and my light bulbs are not camera friendly.